Over the past ten years, the armed conflict between the Maoists and the Nepal government has caused deaths of more than 15,000 people; the destruction of property and infrastructure worth billions of rupees, the displacement of hundreds of thousands of people from their villages to cities and neighboring India, emotional and psychological suffering to millions of people, turmoil in community life and deterioration of the nation's economy. The lack of economic opportunities and general social exclusion, which continued even after the restoration of democracy in 1990, have fueled the spread of conflict, and the insurgency found its greatest support among the most disenfranchised, such as women, youths and lower castes - especially in the rural areas. SUPPORT Nepal initiated Communities for Peace Program (CfP) aimed to minimize the spread of conflict by strengthening community resilience to conflict mitigation, was implemented in Janakpur Municipality of Dhanusha district in Southern Terai of Nepal. Project activities were focused on developing the capacity of community members on conflict resolution, mediation, negotiation and peace building, social mobilization, and a psychological support and referral services that equipped them with the skills necessary to carry out project activities. Community based peace centers established in project area. Peace centers provided on-going psychological counseling support, formed Peace Action Groups (PAGs) engaging 21 displaced young men and women including the youths vulnerable to being engaged in conflict, and youths from socially excluded groups. They were mobilized for peace building activities. More than 37 community groups’ members participated in a series of stakeholder orientation programs and individual meetings that were organized in the districts level. The PAG youths met regularly at their peace centers to share their experiences, learning, problems and common issues, and to plan and initiate peace-building activities in their districts. 21 peace-focused activities were conducted reaching out to an estimated 7,651 people. 6 events of vocational opportunities trainings and workshops were organized for PAG youths. These training and workshops strengthened the youths' individual confidence and earning capacity. Through the peace centers a total of 53 people received psychological counseling service and 259 people were referred to schools, hospitals, legal institutions, government agencies and NGOs for additional services. After the counseling services 33 people were surveyed, out of which more than 50 % said they were satisfied with services provided by the peace centers. Many PAG young people surveyed said that they became able to transform their feelings of anger/revenge into forgiveness and the quest for peace. In a country like Nepal where young people account around 30 percent of the total population, they were deprived of taking part in any sort of development activities. At the other hand, everyday more and more youths were entering the employment market but the opportunities were limited and unemployment among Nepali youth was increasing. That caused youth towards vulnerability, which benefited the anti-social elements to expand their grip over those youths. That also increased the risk of being affected from armed conflict-directly or indirectly. There was utmost need of addressing those deficiencies by recognizing and capitalizing young people- a vital stakeholder in creating a more inclusive peaceful society. If we would take up the challenges of networking and engaging those youth talents and innovators, they would continue to act as peace facilitators and development champions and also as focal points within their community-providing safety net to the displaced youth and other vulnerable youth leading to more equitable, connected, inclusive and peaceful community. SUPPORT in coordination with Zonal Police Office, Janakpur organized a one-day workshop which led to creation of a network of youth, youth organizations, and the interested government and non-government institutions to facilitate the role of youth in sustainable peace and development. 37 representatives of 19 youth organizations from Central Development Region/ Nepal took part in the Summit. A major challenge of most post-conflict situations is that of creating an enabling environment for the return and reintegration of the displaced. Post-conflict environments are also environments awash with weapons, especially small arms. Establishing security and the rule of law is fundamental to a successful return and reintegration process. Similarly, property restitution issues and access to land are further necessary elements of an enabling return environment. Unless institutions or mechanisms are in place to deal with such issues, disputes can rapidly escalate into conflict, especially if different ethnic or political groupings are polarized. Resolving land and property dispute is inevitably time-consuming, especially if records never existed or existed and have been destroyed during conflict or when traditional or legal authorities have limited capacity. Until and unless there was an transparent and participatory dialogue among political parties including CPN (Maoists) (Maoists), administrative bodies, media, IDPs and other key members of civil society organizations take place, those problems were not going to be effectively solved. In order to create an environment for participatory and transparent dialogue, SUPPORT joined hands with National Human Rights Commission and OHCHR to organize one-day workshop on Right to Return; Challenges and Opportunities which was focused at raising awareness about the rights and issues of IDPs in Dhanusha district and UN Guiding Principles on Internal Displacement participated by 37 representatives from political parties, human rights networks, media and civil society. The Tarai revolt in January 2007 had highlighted increasing disenchantment of the population with the ongoing political transition. If left unaddressed, that could potentially derail the ongoing peace process. As different agitating groups in the Madhesh were not politically organized under one umbrella and leadership, there was a need for dialogue on the major demands of the Madheshi people including Madheshi activists, local leaders, media and civil society members for raising consensus over the different issues of Madhesh. SUPPORT Nepal initiated “Facilitating Identification of Madheshi Issues and National-level Dialogue”. 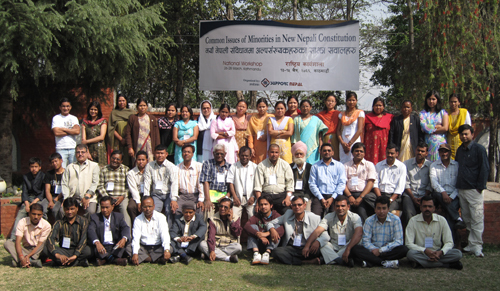 The program was initiated at a time when Nepal was undergoing transitional period and Madheshis, and indigenous population located in the Tarai region bordering India, constitute about 40 percent of the population in Nepal had been raising their voice against the historic marginalization from the political, economic and social sectors of the country. SUPPORT organized district level workshops in 7 Terai districts (Siraha, Dhanusha, Mahottari, Sarlahi, Rauthat, Bara, and Parsa) of southern Nepal aimed at strengthening a common Madheshi platform through local-level dialogues in the Tarai by mobilizing a wider segment of the Madheshi society to participate positively in the political transition. The 357 participants of the 7 district level workshops were focused on identifying the issues of Madhesh in four broad categories; social, political, economic and cultural. The participants also spent a considerable amount of time analyzing existing political, social, economic and cultural aspects and trends before identifying the issues. They also discussed the challenges of addressing the issues. The issues identified from the district level workshops were published in a booklet Issues of Madhesh in English and Maithili language. Finally, a Dissemination Workshop was organized at Kathmandu to disseminate the findings and recommendations to the government talk team and Madheshi Jan Adhikar Forum (MJAF) besides the representatives from various government and non-government organizations, networks, UN agencies and diplomatic missions in Nepal. Ten years of fighting between the government of Nepal and Maoist rebels resulted into killing of over 13,000 Nepalese and produced a substantial human displacement. Estimates on the number of IDPs vary, with different agencies reporting figures between 100,000 to 500,000. An unknown but potentially even larger number of persons affected by the conflict had fled to India, joining a substantial migrant labor population already present in that country. Armed conflict destroyed the social fabric of Nepal. It disrupted community network and traditions, created and reinforced inequalities, destroyed human capacities and social capital, damaged infrastructure, increased the transmission of diseases (especially HIV/AIDS) and killed and displaced large numbers of people. In the aftermath of conflict, communities remain extremely vulnerable, especially when they have few resources to use for reconstruction and reintegration of conflict victim. "Peace Education and Conflict Resolution through Socio-Economic Reintegration of Conflict Victim (PEACE)” was a SUPPORT initiative that was focused at three post-conflict contextual aspects; social, economic and political that needed prime attention and to be considered wisely in order to resolve the conflict associated with reintegration of conflict victim in Dhanusha district. The project provided technical support to the local administration to address the issues of IDPs right to return and enhancing social security net for the sustainable return of displaced populations. The project also identified 413 displaced populations of Janakpur Municipality willing to voluntary return, facilitated their registration to local administration, assisted local administration for providing government assistance for the returnees, mobilized local communities for enhancing social security base for the returnees and is in a process of establishing a community led regular monitoring system for the retuned populations. Besides, an informal community based monitoring system was set up as considered useful and effective for the regularly monitoring of returnees in the VDC. A Local labor Market Assessment was also conducted which helped significantly in designing and delivering micro grants to the conflict victims. In order to strengthen the capacity of civil society and community members to resolve conflict and help conflict victims, different capacity building activities were implemented during the project period. Human rights training to 28 school teachers, UNSCR 1325 training to 24 women representatives of various organizations, Conflict Transformation and Peace Building training to 24 representatives of political parties, media, and human rights organizations, Training on Peace Journalism (Media and Peacebuilding) to 30 media persons, Gender Equality and Social Inclusion training to 28 socially-excluded groups representatives were organized to enhance the capacity of civil society members. As the project was primarily focused on youth, 28 school-based Youth Action Group (YAG) were formed in the project area representing 225 rural youth from different age, caste and ethnicity. Similarly, altogether 115 school based peace activities were organized participated by 4046 rural youth. Those activities promoted youth role in local peace building activities that furthered their integration into their communities, and promoting their role in peace building. Similarly, 28 radio listener groups (RLGs) were formed to address the problem of information gap at the rural areas. 264 rural youth from the project VDCs were engaged in raising awareness about conflict, peace and human rights issues through their respective groups. A set of radio was also provided to each group in order to encourage them for collectively listen and discuss over the radio episodes and provide feedback and comments to the radio program producer enabling them to satisfy the information need of the rural population. Community Peace Center (CPC), established in Janakpur Municipality, provided services ranging from library to counseling and referral services to more than 1708 community members. There are several attended issues related to transitional justice and the recently started identity based conflict from Terai region. Terai uprising has dramatically changed the national scenario and political environment of the country. Government’s failure in analyzing, addressing and implementing the demand of Madheshi people led to protests and unrest and some armed group agitating which resulted into human rights violation. Displacement in Terai appeared to accelerate with the rise in abductions for ransoms and killings by different armed groups which touched almost all ethnic groups, but people of hill origin were particularly targeted. There were not any clear directives or policy on those killed and disappeared during insurgency. 169 persons were killed and 8 disappeared during insurgency in Dhanusha district. Their voices and issues were not heard or addressed. Addressing the issues of those killed/disappeared during insurgency and reconciliation between them and the returnees were one of the major tasks yet to be done in order to ensure safety of returnees and restoring social cohesion in the communities. To address those issues, SUPPORT Nepal (SUPPORT) initiated a 5 months project “Action for Peace and Reconciliation” since 25 August to 31 December, 2007 in Dhanusha district. Technical assistance to local administration was provided to form local peace committee in Dhanusha district. SUPPORT Nepal was elected as one of the nineteen members of the LPC Dhanusha. Conflict victims from government and CPN-M party were approached, discussed and supported to form a common organization of conflict victims. LPC Dhanusha was coordinated to prepare a three-year strategy plan on Peace and Reconstruction in Dhanusha district. Capacity of local peace committee and conflict victims’ organization were strengthened by providing training on the mandates of LPC and peace process in Nepal. 10 episodes of radio program were produced and aired through local community FM creating and promoting a dialogue space on contemporary issues. Women, though directly affected by the conflict and instrumental in supporting the peace process, had been sidelined by the political parties and the government in the transition period, in particular in this crucial period in the lead up to the CA elections. The situation was particularly acute in the Terai where existing social norms tend to exclude women. Advocacy Campaign on UN SCR 1325 in Terai was initiated by SUPPORT Nepal that raised awareness among ordinary rural women of Central and Eastern Terai on UN SCR 1325 mandates on Women Peace and Security to empower them to prepare an action plan for systematic and sustainable implementation of the mandates. The project was the first of its kind in this region focused not only on educating the local women and their stakeholders in United Nations Security Council Resolution 1325 but also on drafting an action plan of the theory/ resolution. Attempts were made on raising awareness, capacity building and drafting action plan for future implementation aimed at promoting Terai women’s role in peace process. The media and grass-root level women organizations were the key target of awareness raising component. Attempts of bringing media persons to understand the UN SCR 1325 were fruitful as they were very keen not only to put their time and endeavor during the workshop but also raised the prominent concerns and burning issues of women of their respective areas. They also wrote articles on the issues contributing to UN SCR 1325. Local FM stations were the key medium of disseminating the news/information about the media workshops and its contents besides series of news on print media. Women from dalit, janjati, muslim, and conflict victims groups were focused during capacity building activities. 29 women from 7 most sensitive districts of Nepal (Siraha, Dhanusha, Mahottari, Sarlahi, Rauthat, Bara and Parsa) were capacitated as Master Trainers on Women, Peace and Security. They, after completion of the training, capacitated 202 women from grass-root level on the WPS issues. These trainers/activists have formed a regional-level Women Peace Network (WPNet) and have successful in forming district chapter of WPNet in all 7 districts to institutionalize the network and practice the learning of the training. They also issued a declaration (Janakpur Declaration on Women, Peace and Security). An action plan on WPS was prepared after consulting grass-root level women and community based organizations, self-help organizations, district level stakeholders including government and non government agencies, media, political parties, chamber of commerce, and other key members of civil society organizations. Similarly survey had been done and focused group discussions were organized in all 7 project districts with focus on discussing the issues of grass root level women in these districts. All these FGDs, survey and consultations as well as the review of existing information were the basis of drafting the action plan at district level. The draft action plans were discussed at district level participating women representatives of all key stakeholders at district level. Participants’ feedback and suggestions were added to the final action plan which, eventually, got a shape of a book named ‘The Women of Terai in Peace Process; Action Plan’, published in Nepali and Maithili languages. The action plan has identified 6 key areas of intervention; political participation, access to public service, participation in media, participation in development, improvement of women’s human rights, and access to information, education and communication. All publications of the project, e.g. poster on WPS in Maithili, leaflet on WPS in Nepali, Resource Book on WPS and the action plan were widely distributed in the project areas and are being used as resource materials by other concerned agencies and individuals. In spite of some constraints and limitations of time and resources, the project is successful in raising women’s concerns, capacitating women at grass root and district level and promoted role of stakeholders and documented the common voices of women in this region which will, eventually, lead to incorporate the women agenda in constitution making process and institutionalizing the efforts of addressing the decades long issues of exclusion and marginalization of women in the patriarchal Nepali society. After the People’s Movement of April, 2006 and Madheshi Revolt of January, 2007, dynamics of the conflict in Nepal have been changed from political ideologies of CPN-Maoist to the ethnic and identity-based conflict such as the conflict of Madhesh. Government’s failure to analyze and address the genuine issues/demands of Madheshi people (who constitutes about the half of the total population of the country) tending to turn Madhesh as a breeding ground for different armed groups declaring armed-conflict against the state. Although most of the armed groups are declared their confrontation with the state, victims of their activities are civilians. In some cases, the hill-origin person seems more in target. This is leading to increase in the number of displacement and re-displacement. In such a delicate environment, media’s role became more important than ever in providing neutral and authentic information to the people that helps decelerate the conflict. However, that was one of the critical gaps widely found in Nepali media arena. Ordinary citizen’s voices and issues were not of priority for media coverage. People’s concerns, issues and agendas were, more often, shadowed by political propaganda and over-stretched news having less interest of the people. SUPPORT Nepal (SUPPORT) initiated a 4 months campaign; “Promoting Voices of Voiceless for Conflict-resolution and Empowerment” in Dhanusha district. The project was designed/planned to address the gap of raising the voices of voice-less people with focus on the conflict victims of Dhanusha district through radio dialogue. 16 episodes of radio dialogue on human rights, peace and constituent assembly-focused were produced and aired. Thousands of IEC materials were produced and disseminated throughout the rural areas of the district. Election for the Constituent Assembly emerged as the single most critical agenda for shaping the political structure of modern Nepal. All the political parties, including the CPN (Maoist), agreed to go to the people to seek their support for legitimizing their specific political agenda for social, political, economic, and cultural reconstruction of future Nepal. SUPPORT designed and implemented a civic education program with focus on voters' education as a basic pre-condition for a meaningful Constituent Assembly (CA) through which the voters could make informed and rational choices to elect their right candidates in 60 VDCs of Dhanusha district. Approximately 2250 key representatives of political parties, professional organizations, student unions, trade unions, and non-government organizations were benefited from voter education classes and orientation about the CA election processes and post election follow up. The end of royal direct rule and cessation of major armed action by the CPN-M has produced an opening where some of the complex challenges of rights abuse, displacement and return can begin to be addressed. The recent signing of an agreement between the interim government and the CPN-M – leading to their disarmament, demobilization and inclusion in the interim government itself – marks another step forward in the ‘road map’. This represents a critical juncture in the unfolding peace and democratization process, at which the international assistance community can put in place projects that will strengthen local capacities for achieving durable peace and stability while addressing more immediate humanitarian needs. SUPPORT Nepal initiated "Communities for Peace and Reintegration in Dhanusha-district (CPRD)”. The project was initiated at a time when Nepal had completed first phase of transition (completion of the Constituent Assembly election) and was moving on second phase of transition (drafting the new Constitution of Nepal) with pending issues of different agreements signed between the government and various agitating groups including the Comprehensive Peace Agreement (CPA) consisting of issues of seized property, return and reintegration of conflict victims. Needs and trends of communities such as demography, local groups/clubs, access to citizenship and birth certificates at 10 VDCs were collected and analyzed. More than 14 human rights and peace-focused organizations were mobilized to celebrate International Peace Day on 21st September 2008. More than 1230 people approached, participated and mobilized for various peace activities during the course of the project activities. Approximately 600 signatures collected during Signature Campaign and were handed over to the President of Nepal, Rt. Honorable Dr. Ram Baran Yadav. He assured about raising the concerns as mentioned in the campaign to the concerned officials such as the Ministry for Peace and Reconstruction and National Human Rights Commission. Approximately 2000 people participated in various peace campaigns through rally and other activities of International Peace Day. 10 VDCs population were provided with information and documents about rights issues, constituent assembly, and other key services being provided by various service providers at the district level. Registration of conflict victims at the local administration, compilation and availability of VDC Offices’ Citizen Charter/s at the peace centers, health, school and other services and the name and contact details of the these providers at the peace centers were contributed tremendously bridging the information gap at the local level. More than 2190 persons were outreached through the mobile CPC and 1200 rural population visited the CPC during project period. The project also facilitated the issuance of 187 citizenship, 64 birth and 91 marriage certificates inside the project VDCs. 90 sessions of ward level meetings were held in 10 project VDCs that led to the formation of 10 Community Action Group (CAG). 1329 persons were involved in implementing micro projects benefiting more than 10000 rural populations. Information about 139 conflict victims were collected and verified. After verification, 139 persons killed during armed conflict were registered with the District Administration Office, Dhanusha to claim for compensation package from the MoPR. Those registered victims received different compensation packages from the central government. Among the killed victims; the rebel forces killed 24, 102 by state, 7 deaths were unknown and 4 were killed in explosion. Likewise, 96 were provided with micro grants to start their own micro enterprises. 10 rural schools were provided with technical and financial support to improve their education facilities and teaching environment. 191 children affected by the conflict were provided with scholarship support/material support. Similarly, 10 rural health posts were provided with technical and financial support to improve their health service delivery facilities. The project contributed to improve the life standard of more than 9421 rural populations directly from the project activities and thousands others from improved education and health service delivery mechanisms and facilities. Yes. There are significant amout of progress toward a culture of peace and non voilence in our working constituencies. Areas which are vey much affected by armed conflict are not being comparatively peaceful. Conflict victims from both sides; the state and Maoists are not sharing the same community and space. Community members and conflict victims have now started working together to rebuild their societies. Minority groups are not united to stand for their rights in peaceful and non violence way and are advocating for their rights to be ensured in new Constitution. I) Unstable government and conflict among political parties result into almost no governance at local level which leads to frustration among people as they're not receiving basic services. II) Fluid political situation and breach of peace agreements makes working environment more complex . III) Civil society, human rights and peace activists' political affiliation degrade the value of culture of peace and non violence movemet as their activities do not serve the people in general but to their affiliated political parties. IV) Favoritism, nepotism and party-centeric distribution of aid money deprives financing the project aimed at rural population and those affected by conflict. V) Pressure for donation from parties' youth wings and armed groups affect the smooth operation of project especially in rural areas. VI) Poor coordination and synergy among organizations result into less effective movement for peace and non violence throughout the country. VII) Government's ignorance to implement the peace agreements with various armed groups stimulate the agitating groups follow violent path for advocating their issues. I) Improve coordination and strengthen capacity of minority groups to advocate for their rights in non violent way through awarenss raising, advocating their rights and action to enhance their socio-economic status. II) Policy advocacy to incorporate minority rights provisions in new Constitution and formatulate appropriate laws, policy and programs to implement the constitutional provisions. IV) sharing experiences, lessons learned and information among peace builders and campaigners.